ABC Commissary New Menu Options are Mouthwatering! 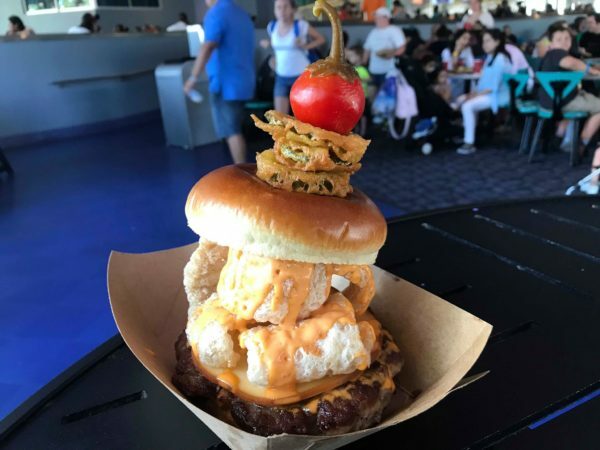 If you’re looking for a quick and delicious meal while exploring Disney’s Hollywood Studios you’ll want to check out the ABC Commissary new menu options! We are loving the new choices available for lunch and dinner! On both the lunch and dinner menus you will now find the Mediterranean Salad with Chicken or the Vegan Burger. The salad comes with grilled chicken breast on a bed of fresh mixed greens with cherry tomatoes, red onions, pepperoncini, kalamata olives, and feta cheese tossed in a Mediterranean vinaigrette and served with hummus and flatbread. My mom is already eyeing that new salad for our trip later this fall! If you’re looking for something vegan, the Vegan Burger is perfect for you! This burger comes topped with lettuce, tomato, sautéed peppers and onions in a balsamic glaze, vegan mayonnaise ketchup, and sriracha mustard and served on a brioche bun with french fries. If you’re in the mood for a burger, try the Southwest BBQ Burger with a flame-broiled 1/3 lb angus burger topped with sweet BBQ pulled pork, bacon, bread and butter pickles, and cheddar cheese finished with garlic aïoli and crisp onion rings between Texas toast and served with signature southwestern steak fries dusted in chili-lime seasoning! And don’t forget dessert! You can get the newChocolate Banana Cream Almond Crisp or a Toy Story Land Cupcake (which can also be found at The Trolley Car Café). In celebration of Toy Story Land opening you’ll want to try this chocolate cupcake is topped with vanilla buttercream and a white chocolate piece! Are you hungry yet? I know I am! What are you most looking forward to trying out of these new options?